Mooted for several months, and now enshrined in legislation, NSW Premier Barry O’Farrell has effectively wrested control of inner Sydney’s traffic management and planning from Mayor Clover Moore after legislation passed through parliament this month to form a joint state-city traffic control committee. 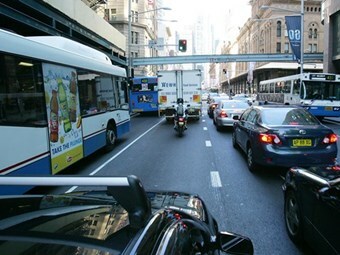 NSW Roads Minister Duncan Gay says the legislation is to ensure major transport decisions are ‘properly’ coordinated between the NSW Government and City of Sydney Council. The City of Sydney Amendment (Central Sydney Traffic and Transport Committee) Bill 2012 allows for the establishment of a Central Sydney Traffic and Transport Committee, to be responsible for coordinating plans and policies for public transport and traffic within central Sydney and making decisions on major transport issues. "Sydney is Australia’s only global city and the CBD deserves a first rate and properly functioning roads and transport system," Gay says. He says both levels of government need to work together to ensure the best possible outcomes are delivered so the state can move forward. "Currently the NSW Government and Council share transport and roads responsibilities and there is ad hoc coordination between the two levels of Government," he says. "The Central Sydney Traffic and Transport Committee will, for the first time, bring all traffic and transport decision-making under the one umbrella, co-ordinating the activities of 14 transport working groups, on which the City and State agencies are currently represented." Gay says the NSW Government was in disagreement with the Council on a number of transport issues including speed limits and car access to the CBD, the provision of layover space for buses, the extension of the network of bikeways and the extension of low-speed shared zones. The Central Sydney Traffic and Transport Committee will be chaired by the Director General of Transport for NSW, Les Wielinga, and include an additional three members nominated by the NSW Government and three by the Council.